Even at that speed the ’Busa was accelerating harder than a runaway locomotive on a steep downhill grade, and the absence of wind noise and turbulence lulled me into a false belief of a slower land speed. While it’s not advisable to travel this fast on a public road it is testament to the Hayabusa’s high-speed composure. New to 2013 Hayabusa are Brembo Monoblock calipers with a slightly larger piston diameter (32-32mm vs 32-30mm). Anti-lock brakes are now standard on 2013 models. Moments later, after having slowed to a somewhat legally acceptable rate, we found ourselves stuck behind a few crawling cagers. The incredibly flexible ’Busa accepted the situation by maintaining 24 mph in 3rd gear at 2500 rpm and the engine didn’t bog when asked to accelerate. 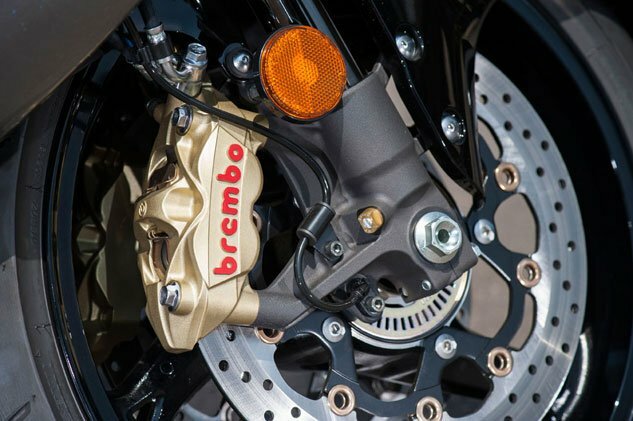 Slowing the new ’Busa are a pair of Brembo monoblock calipers up front. 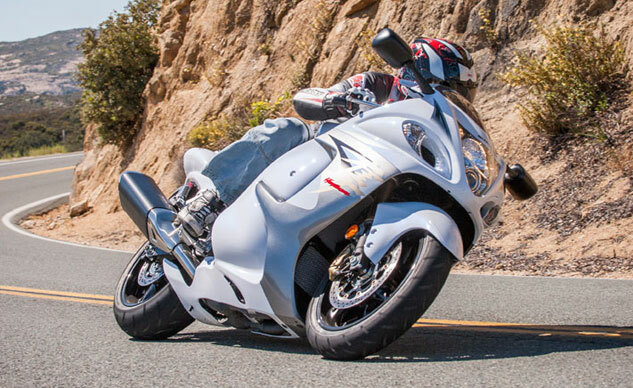 In our 2012 review of the Hayabusa LE we found its brakes faded with repeated use. The new Monoblocks appear to have resolved this problem. Also new in helping to safely slow the hyperbike is standard ABS. The Marble Daytona Yellow / Glass Sparkle Black color scheme is the limited edition model for 2013 and costs $200 more than the two standard model color schemes. Besides these braking upgrades and new color schemes the Hayabusa remains largely the same bike since its 2008 makeover. In this time, however, only Kawasaki’s ZX-14R, introduced last year, has managed to surpass the ’Busa in hyperbike honors. We compared the two last year, and while the ZX won the shootout (it also garnered our choice for Motorcycle of the year) the big Suzook formidably held its ground. The Hayabusa also best the Kawi in fuel economy, getting six miles more per gallon than the Green Meanie. The Hayabusa also best the Kawi in fuel economy, getting six miles more per gallon than the Green Meanie. Comparative prices between the ’Busa and the Kawi for 2013 remain in Suzuki’s favor: $14,399/$14,599 Limited Edition vs $14,999 standard/$15,999 ABS model. 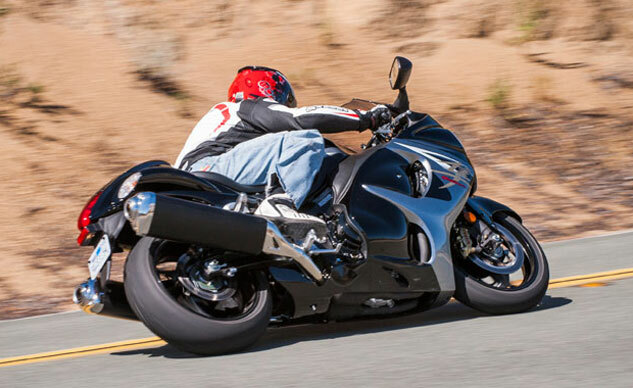 Weighing 586 wet pounds, the Hayabusa’s heft isn’t trivial, but its lithe handling attributes allows serious lean angles. Get in a little hot, however, and the ’Busa makes its weight known. Fifty years ago Suzuki Motor Corporation set up shop in Los Angeles, California. To celebrate the occasion Suzuki is running a sweet financing deal on its Hayabusa and Gixxer models including a free Yoshimura slip-on, cash back and 0% APR financing. Considering these programs and its lesser MSRP, compared to the Ninja, it’s a big savings on a helluva fast motorcycle that’s worth considering. 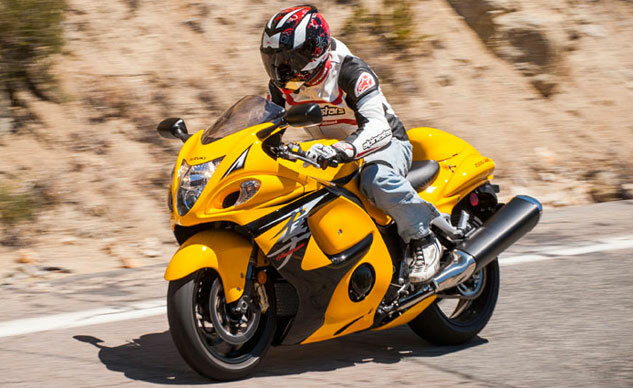 Check out our full 2013 Suzuki Hayabusa photo gallery here.